Happy Cigar is the economical bundled house brand of Hollywood, FL B&M and online retailer Cuenca Cigars. I am told it sells well at the store, so as someone always looking for a bargain, I wanted to give it a try. The Happy Cigar line comes in two different iterations, Happy and Happy I, with each having both natural and maduro wrappers. The Happy I is made for Cuenca by El Galan Cigars at the El Galan Cigars S.A. factory in Esteli, Nicaragua, and is a Nicaraguan long filler puro. The Happy I is available in six sizes: Robusto 5 x 50, Toro 6 x 50, Torpedo 6 x 50, Double Corona 6¼ x 50, Churchill 7 x 50, and Toro Gordo 6 x 60. Prices for the 25 count bundles run from $39.99 for the Robusto to $53.99 for the Toro Gordo, and can be ordered from Cuenca Cigars here. 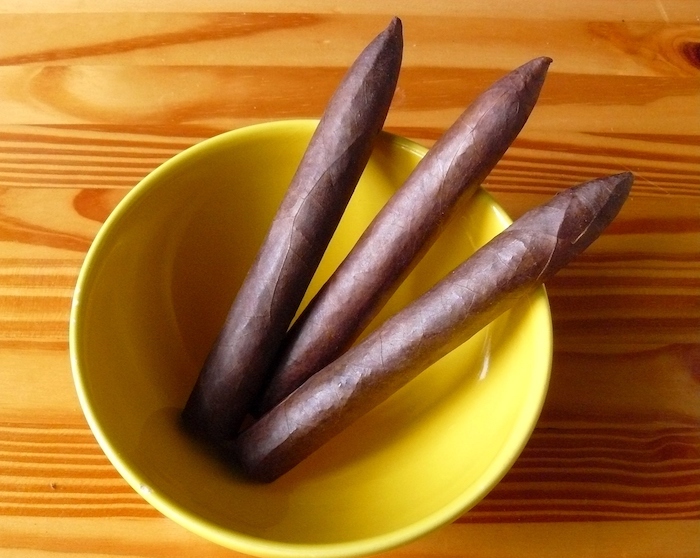 A $2 bundled, non-cellophaned and unlabeled cigar, the Happy I’s medium brown wrapper is mottled throughout with both lighter and darker splotches and has several fine to medium veins, an oily sheen, and areas of fine tooth. The pack is generally firm with a few softer spots and tight seams. All in all, though, the cigar looks and feels just fine. The wrapper carries a faint earthy barnyard scent on top of natural tobacco, while the foot gives off cedar and tobacco. The cold draw is open and shows light sweet spice and cedar. Upon lighting, the draw of the Cuenca Happy I snugs up to just the right amount of resistance for me, pouring out gobs of sweet earth, leather, and rounded woodiness on a smooth and mild body. Natural tobacco serves as the base of the flavors. 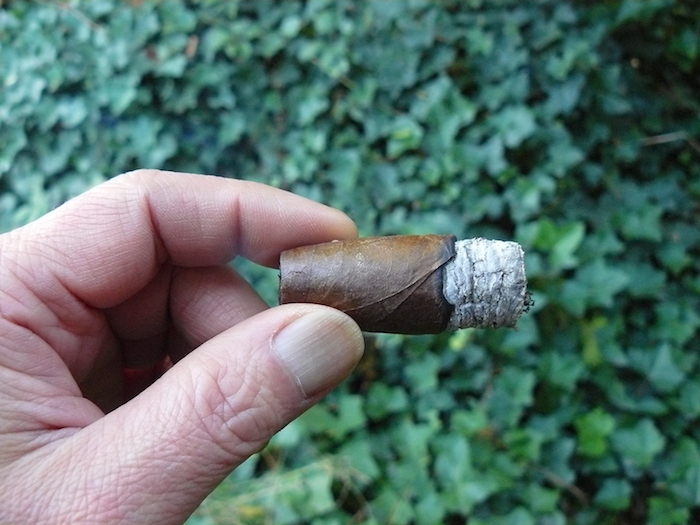 The cigar is burning at a bit on a slant, but the burn line is sharp and the light gray ash is compact, tapping off at 1”. Light bread notes and some pepper move into the mix. By the end of the first third, the Happy I is burning dead even and razor sharp. Entering the second third the body is still on the mild side, as musk and a light, sweet citrus note joins in. The wood has become a stronger component as the leather has receded, and the pepper has become more active on the retrohale. The middle third winds up with the Happy I closing in on medium with no nicotine strength. The final third of the Happy I doesn’t bring in any new flavors, but intensifies the already existing ones, finishing at a solid medium body, with little noticeable nicotine effect and no harshness. The resulting nub is cool and firm. 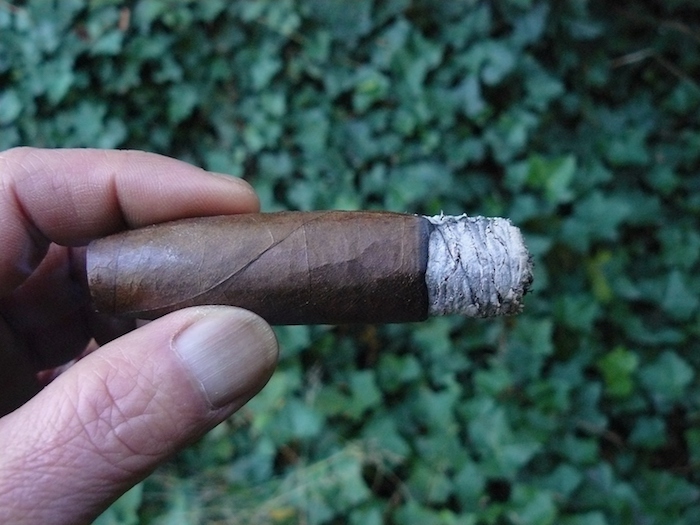 The Cuenca Cigars Happy I cigar surprised me with its solid construction and burn, and the flavors, while not complex or myriad, were enjoyable. 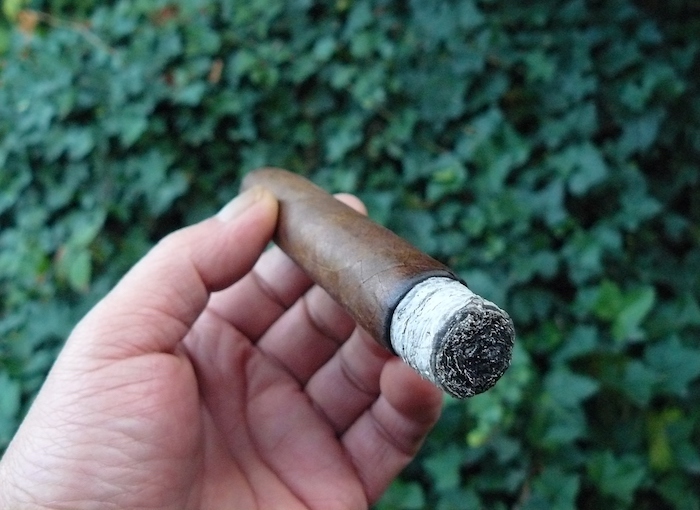 What impressed me most was, unlike so many other inexpensive bundle smokes, it developed more intensity as it went along without the big drop off I have so often experienced, with the final third being the most enjoyable. Having smoked nearly twenty of the bundle, it’s not the most consistent in terms of build, and I don’t expect a $2 stick to be so. Some are packed tighter and have a more restricted draw and the caps are not all tapered alike. Some are a little deeper and more peppery in flavor, but none struck me as unbalanced. This one seemed to smoke a little faster than others, although I didn’t keep track of the ones I previously had, so that may not actually be true. All in all, I found this cigar to be a solid smoke and an absolute bargain. In fact, if I had not known the cost, I would have expected it to be double the price, which makes me happy (yes, pun intended). Cigar smokers who desire a budget friendly mild to medium everyday smoke would do well to grab a bundle. I will now have to give the maduro version a shot. I will admit that choosing a beverage to pair with a $2 cigar isn’t going to be a major area of concern for most folks. I mean, if they don’t go that well together, no big deal, right? 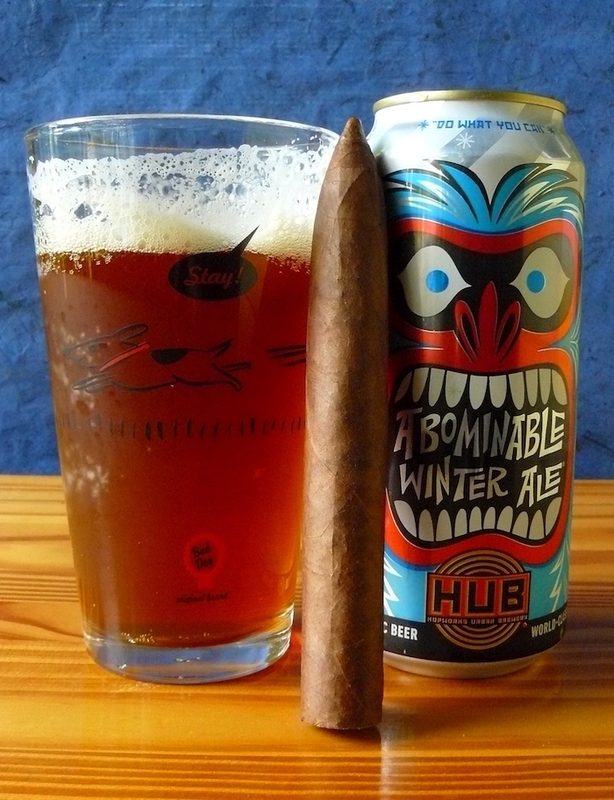 Still, I wanted to be fair to both the cigar and the beer, so I went with a brew that I felt would provide an agreeable match. Abominable Winter Ale from Hopworks Urban Brewery, aka HUB, of Portland, Oregon is a seasonal release that I look forward to picking up on each year when the temps cool down. It’s like a ramped up amber ale; maltier and hoppier, with citrus and dark fruits and caramel. The malt and citrus matched well with the Happy I, although a number of other styles such as a weizen, dubbel, or brown ale would provide a suitable match. A fruity red wine would also be ideal.